This dish can be eaten any time of the day, but most Kelantanese eat it for breakfast. It is made from flat rice noodles topped with a thick, fish-based coconut milk gravy and served with ulam (raw herb and vegetable salad) and sambal. 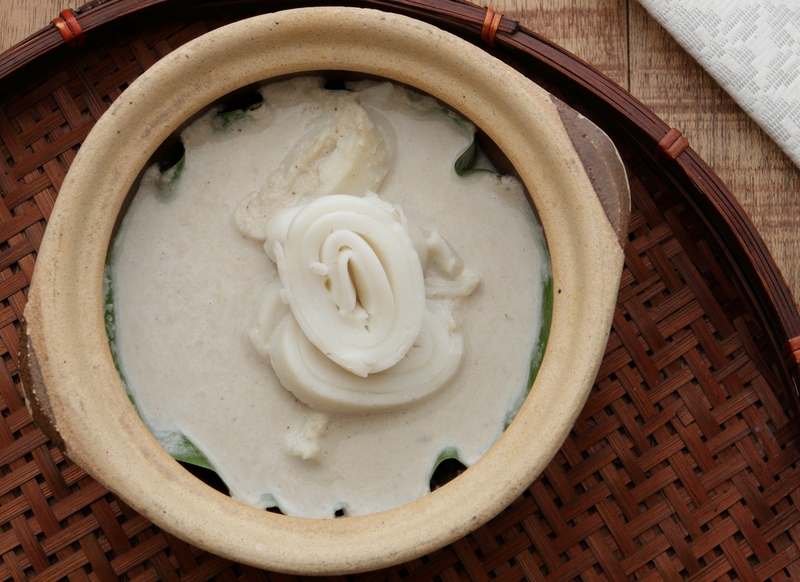 Because the gravy is so thick, laksam is traditionally eaten with the hands, although most people use utensils these days. Zainab Ahmad Shiyuti is the co-owner of the Belanga restaurants. This recipe was first published in Flavours magazine. Sift the flour into the water and stir until mixture is smooth and thoroughly combined. Place a flat, round stainless steel plate into a steamer. Lightly oil the plate, then ladle in the batter until it is about ½cm deep. Use the back of the ladle to spread the batter evenly. Close the lid and steam on high heat for about 3 minutes, until cooked. Remove from the steamer and leave to cool for about 30 seconds. Lift one end of the circle, fold it in tightly and continue to roll until you’ve reached the other end of the circle. Set the roll on a plate and cut it at 2½cm intervals. Repeat for the remaining batter. Place the shallots, ginger and garlic into a food processor and blitz to form a paste – add some water if necessary. Place the oil in a pot and saute the paste till fragrant, then add the coconut milk and sugar. Bring to a boil, then add the fish and season to taste. Slice leaves and bunga kantan finely. Toss together. In a pan, fry the chillies, belacan, garlic and tomato for 5 minutes, then place into a food processor and blitz to form a paste. Season to taste. Spoon into a saucer and place lime halves on top. Place the flat noodles in a bowl or claypot and ladle some gravy over them. Serve with the ulam, sambal belacan and serving accompaniments.